Affix Windows install beautiful aluminium bi-fold doors in Sidcup, Blackfen, Dartford, Bexleyheath, Welling, Bromley, Chislehurst, Kent and surrounding London areas. Aluminium bi-fold doors are a high performance, sleek, stylish and practical addition to both modern and traditional properties. We offer doors to Sidcup homeowners that will guarantee a safer, warmer home without the expensive price tag. The bi-folding system these doors use allows maximum accessibility to your garden or property interior. This is due to the fact that 90% of the door aperture will pack neatly away when the doors are opened, making them the perfect choice for wheelchair users or family gatherings. Offering all the best of modern design, our aluminium bi-fold doors achieve home-enhancing degrees of quality with class. With a beautifully contemporary finish, these doors will prove to be a beautiful addition to your home in Sidcup. Aluminium upholds impressive standards of inherent strength, offering a profile that is incredibly rigid and robust. This means our aluminium bi-fold doors offer outstanding home security whilst still maintaining a sleek and slim appearance. These exceptionally designed profiles are then enhanced with high security, multi-point locking mechanisms to ensure they uphold impressive levels of crime prevention. Our aluminium bi-fold doors allow you to protect your Kent home the modern way. Unlike traditional timber doors, our slimline bi-fold doors offer all the benefits of high quality without any setbacks. This means they will require minimal input from you to maintain a clean, sheen and contemporary appearance. This also means that they will uphold their standards of quality over an extensive period of time, without rotting or warping proving detrimental to their structural integrity. This allows you easy access to doors that will last and could boost the value of your Kent property. Although aluminium itself has been known to offer poor thermal efficiency properties, our aluminium bi-fold doors consist of intelligent designs to counteract this. Using modern techniques, our doors work to trap in pockets of warm air to ensure a warmer home. 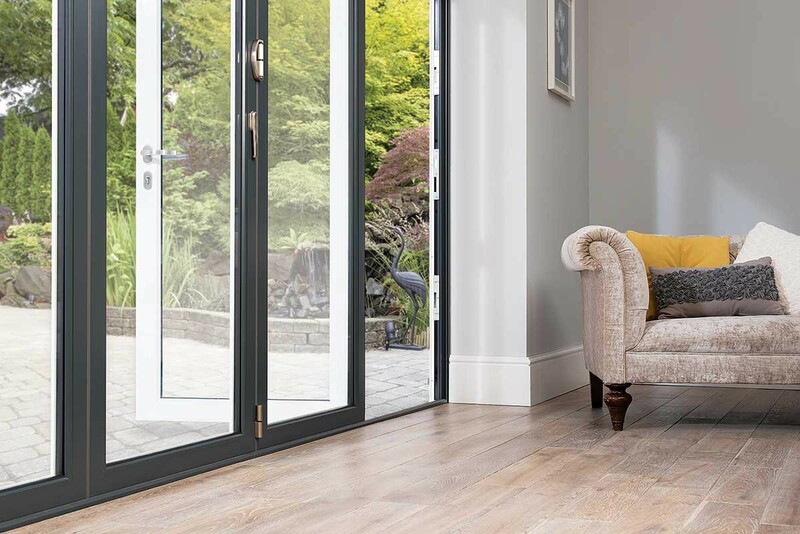 Our aluminium bi-fold doors will not only prove themselves to be a wonderful addition to your Sidcup home, but they will also allow you to cut down on your energy costs. Their standards of thermal efficiency will increase the heat retention of your home, reducing the use of central heating. Although our aluminium bi-fold doors are incredibly modern in their appearance, they can be easily tailored to suit both modern and traditional homes. This is made possible by the comprehensive range of colours we offer. We also offer you the choice of a wide range of woodgrain foils, which allow you to capture a beautiful timber look for your aluminium bi-fold doors. This will allow you to enjoy all the benefits of classic charm without any out of date problems. Get in touch with us via our online quoting form to find out more about our competitive aluminium bi-fold door prices for homes in Sidcup, Dartford and surrounding Kent areas. We’ll be more than happy to help you find the perfect price for your replacement doors. Alternatively, our online contact form will allow you to get in touch with a member of our friendly team, who will be on hand to answer any questions you may have about our aluminium range. Comprising of intelligently designed, high performance hardware, our aluminium bi-fold doors promise effortless and smooth operation. This not only promises ease of use, it also reduces wear and tear on the door which lengthens lifespan. Our range of aluminium bi-fold doors are installed with a high quality, specially designed safety system to guarantee easy and safe use. This includes finger safe gaskets, low thresholds for easy disabled access and strong magnets to prevent the door from slamming. We can tailor our aluminium bi-fold doors to fit seamlessly into any property type, allowing you to choose a range of configurations and panel numbers to get the perfect fit. This enables you to make the most of the space you have.